"We have spent the last four years, journeying across over 20 countries to create not just a film, but a Revolution." Filmmaker and eco-warrior, Rob Stewart, the founder of United Conservationists, has a proven track record in using media to spark meaningful social change. His award-winning documentary film, Sharkwater, empowered people around the world to take action in protecting one of the oldest living species, the shark. Released in 2007, Sharkwater broke box office records, won 35 international awards and spawned a global movement. After 124 million people saw Sharkwater, the world took on the cause in a big way: dozens of non-profits formed, millions of dollars were raised on behalf of sharks and government policy starting changing. Today, there are 65 countries that have banned shark finning, massive shark sanctuaries were created and everyone, from kids to celebrities, jumped on the cause. Sharks are how Untied Conservationists started, but now we have an even bigger challenge. With not just animals and ecosystems in danger, but humanity at stake, we are taking our movement to the next level. We aim to kick-start an environmental revolution, empowering youth to take the lead. Building on the successes and lessons learned from the Fin Free campaign, we will ignite this new movement, partnering as we did with Sharkwater and our founder Rob Stewart, with the release of his next commercial feature film project Revolution. Announcing the Revolution campaign! The catalyzing moment for this movement will be with Rob Stewart's movie REVOLUTION. REVOLUTION is a film about changing the world, the evolution of humanity through revolutionizing humanity. In Rob's second film, he discovers dangers threatening not just sharks, but all life in the oceans, our climate and ultimately humanity. In an effort to uncover the secrets to saving the ecosystems we depend on for our survival, Stewart embarks on a 15-country life-threatening adventure into a great revolution underway to save life on Earth. Starling, beautiful, provocative and transformative - this film is a personal narrative into how we can all save our collective planet. Aiming to have the film viewed by 750 million people, we have a unique distribution strategy that will involve distributing the movie for free on the Internet. 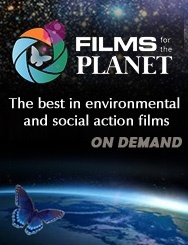 REVOLUTION the film will be the catalyst that drives the public to action, while the REVOLUTION campaign will be the platform, providing outlets for viewers to take meaningful and immediate action outside the movie theater. United Conservationists will lead the REVOLUTION campaign as an international effort to educate, engage and empower the public to create change - focusing on the youth to lead this movement. We will provide the change-makers toolkit, empowering a united community, feeding the momentum through measurable and fast results. We are providing the solutions a generation can rally behind taking on the greatest issue we've ever faced - saving our world to save humanity. Educational Materials: How to Start A Revolution - Empowering youth with the information necessary to save humanity: what's happening to our ecosystems, a who's who of conservation and proven solutions, providing a blueprint for change. This educational material will be delivered in study guides, classroom DVDs, online thematic classroom, and professional development for educators, in partnership with TakingITGlobal. Online Networking Platform: Uniting the environmental movement with eco-activism 2.0 technology. Our Revolution website will crowd-source information on environmental groups, events and actions - allowing users to generate their own content and connect with the larger online community. While geo-mapping technology and an interactive networking frame will provide an entry point for youth, both online and offline, to the movement. Revolution Mobile Application Putting the power to change the world into people's hands. The Revolution application is a mobile and social media networking application that generates mass public support to sway government policy. All with a few clicks, users can mobilize nationally and internationally, track progress of legislation in real time, and eventually, enabling democracy through participation. Save the Humans eBook Dynamic, interactive and constantly updating - this electronic book contains rich content for a slighter older audience (ages 18 - 30). Used to bring the educational materials to life with beautiful images and video, combined with spoken word and info-graphics. This eBook will provide readers the understanding of the ecosystems we depend on, how these systems are being threatened, and solutions to save humanity. Collapse Prevention Report (CPR): Independent assessment of the health of every country and what they need to do in order to avoid collapse. Used to feed content in our multi-platforms - educational materials, mobile app and eBook - and constantly evolving. Compiled by a group of independent scientists, including Dr. Andrew Weaver, awarded the Nobel Peace Prize in 2007 along with Al Gore. This report will be given to an independent body in each country on their birthday and reassessed annually. Junior Eco-Heroes Program: Youth are encouraged to become eco-leaders of a new generation, by creating their own campaigns and projects. Young people will be invited to pitch their ideas on a Youtube video competition with Revolution. The winners will receive crowd-sourced fundraising support, expert consultations to realize their dream, as well as, global recognition with traditional and social media channels.